Say you have different keyboard layouts cause you’re bilingual and need access to accents or different alphabets. The normal way to switch between these two keyboards would be to show the keyboard icon on the top Menu bar and simply click on the icon and choose the keyboard layout you wish to use. Although this works, it’s a bit annoying to mess with the mouse in search of a tiny keyboard layout icon when you just want to hop in to a keyboard layout to get an accented character, then return back to the original that you were just using. The reason Input Menu is disabled by default is that its historic keyboard shortcut has been taken over by Spotlights: Apple Key + Spacebar. For me, I hardly ever use Spotlight, since I’m on the Quicksilver launcher train, which pretty much circumvents my need of Spotlight, so I’m happy to give up Command + Spacebar to be able to toggle back and forth nearly instantaneously between keyboards (French AZERTY and English QWERTY). (See the great things you can do with Quicksilver here). 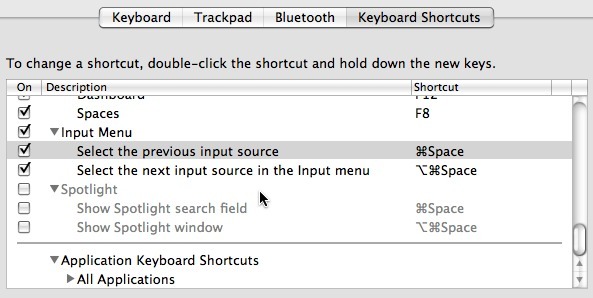 If you’re hot on Spotlight, simply choose a different keyboard shortcut for either Spotlight or Input Menu => Select the Previous Input Source. You can do this by double clicking on the shortcut in question and pressing the new keyboard combination to replace it with.